Marouane Fellaini hit an injury-time equaliser as Everton twice came from behind to deny struggling West Ham a much-needed win. The Hammers and their beleaguered manager Avram Grant seemed on course for victory at Goodison Park as Frederic Piquionne headed them in front for the second time six minutes from time. But Piquionne was sent off for celebrating with fans and the Hammers, who remain bottom of the Barclays Premier League, were denied as Fellaini struck. The visitors had taken the lead after 27 minutes as the once goal-shy Jonathan Spector found the net for the fourth time in two months but Diniyar Bilyaletdinov came off the Everton bench to level. The result was yet another blow for Grant, whose position has again been the subject of heavy speculation over the past week. Yet for most of the game his team, with the returning Scott Parker driving them forward, the visitors acquitted themselves superbly. The Hammers gave their fans early encouragement as top scorer Piquionne, back in the side after recovering from dental surgery, burst into the area and fired over from a tight angle. Mark Noble went even closer moments later as he was picked out by Parker on the 18-yard line but his chip just dipped over the bar. Everton toughened up after those early scares and began to assert themselves more in midfield. Fellaini exposed the Hammers defence when he played in Jermaine Beckford but the striker's flick back was cleared. Beckford had an opportunity himself as he raced onto a through-ball from Mikel Arteta but Matthew Upson just did enough to break his stride and Robert Green blocked. West Ham responded well and snatched the lead as Luis Boa Morte latched onto a Noble pass and squared for the inrushing Spector to slide home from the penalty spot. It was a goal that lifted the Hammers and, with Parker instrumental, they dictated play for the rest of the first half. Piquionne was inches away from adding a second as he rose to meet a Spector cross with a firm header that struck the far post and rolled across goal to safety. 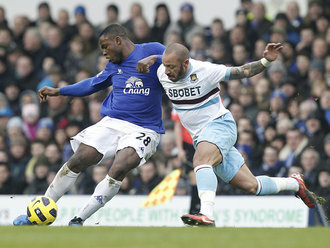 Everton survived another scare before the interval as Boa Morte poked the ball past Tim Howard but was adjudged offside. Everton boss David Moyes decided to change his attack by sending on Saha, fit again after a thigh strain, for Beckford at half-time. The hosts enjoyed prolonged spells of possession as the second half got under way but were unable to prise open West Ham's hard-working defence. Wayne Bridge, after a much-criticised debut last week following his loan move from Manchester City, seemed assured up against the threat of Seamus Coleman on the Everton right. Saha appealed for a penalty after a challenge from James Tomkins but referee Peter Walton gave nothing. West Ham caught Everton on the counter-attack as Parker charged through midfield but Howard comfortably dealt with his long-range shot. Zavon Hines also went close with an acrobatic attempt to turn in a Spector cross but his volley flashed wide. At the other Saha threatened after being picked out by Leon Osman but the Frenchman got the ball caught under his feet and was unable to shoot. Everton pulled level 13 minutes from time as Bilyaletdinov, sent on for the ineffective Victor Anichebe eight minutes earlier, beat Green with a fierce drive. Fellaini rose the highest to meet Phil Neville's cross and his nod down was helped into the Russian's path by Piquionne. Bilyaletdinov, who has been challenged to fill the boots of the departed Steven Pienaar, made no mistake as he caught the ball with a sweet half-volley into the bottom corner. Coleman could have added a second moments later as he cut inside from the right but shot narrowly over. Green then produced a brilliant save to deny Saha from close range and Coleman put the rebound over the bar. But as the Toffees pressed for a winner, they were caught by a sucker punch. Bridge found room on the left to swing in a cross and Piquionne jumped to place a looping header over Howard and into the top corner. The downside for Piquionne - who had been booked four minutes earlier - was that in his jubilation he jumped the advertising hoardings and was shown a second yellow card. West Ham attempted to play safe by substituting substitute Freddie Sears, who had been on the field just nine minutes, and sending on defender Winston Reid. It proved to no avail as Fellaini jinked his way into the area in injury time to secure a point for Everton. Everton Howard, Neville (Rodwell 86), Heitinga, Distin,Baines, Coleman, Arteta, Fellaini, Osman,Anichebe (Bilyaletdinov 68), Beckford (Saha 46). Subs Not Used: Mucha, Hibbert, Jagielka, Gueye. Goals: Bilyaletdinov 77, Fellaini 90. West Ham Green, Faubert, Tomkins, Upson, Bridge,Hines (Sears 81), Spector, Noble, Parker, Boa Morte, Piquionne,Sears (Reid 90). Subs Not Used: Boffin, Gabbidon, McCarthy, Barrera, Nouble. Goals: Spector 26, Piquionne 84.